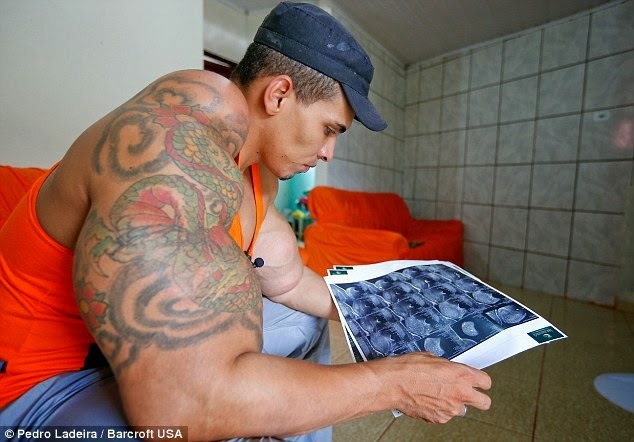 A bodybuilder almost lost his arms after injecting a cocktail of oil, painkillers and alcohol into his biceps in his bid to look like the Incredible Hulk, Goiania in Brazil. 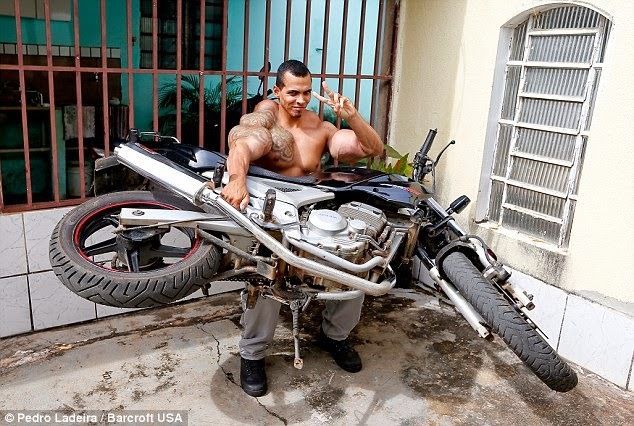 Father-of-one Romario Dos Santos Alves, 25, was injecting oil, painkillers and alcohol into his biceps, called synthol, for three years and he now faces a wide range of serious health issues. The former bodyguard said using synthol cost him his sanity and nearly his life as he tried to kill himself when his wife was six months pregnant. Speaking about his obsession, Alves said: “I saw some really big guys in the gym with huge arms and I started to make friends with them. They introduced me to synthol and I got excited about the results – I lost control. My muscles started to solidify and I couldn’t even inject my arms – they were full of rocks. 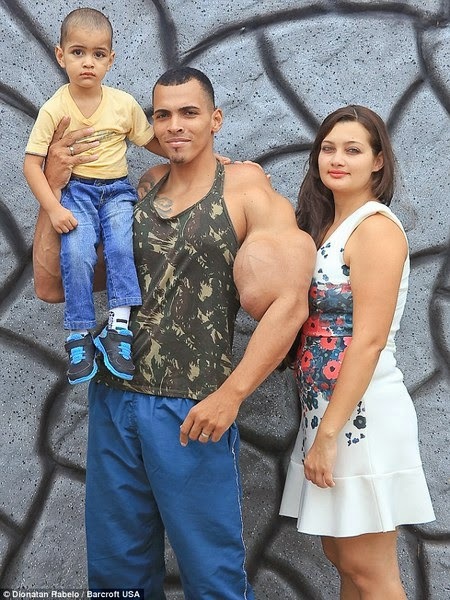 But soon his wife Marisangela Marinho, 22, said he had to choose between their relationship and the synthol. 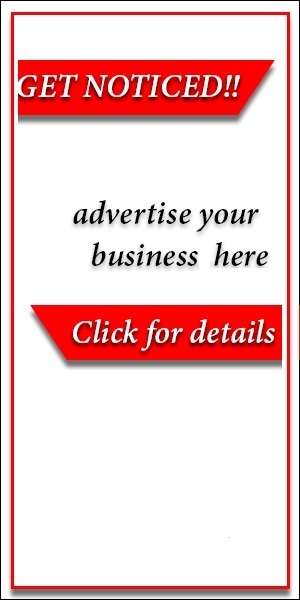 He was in constant pain, depressed, even tried to kill himself and lost his job. Eventually he decided the only course of action would be to have the limbs amputated and get rid of destructive addiction. “That was the hardest part of our life because I had depression and I was removed from my job because I tried to kill myself. My wife was crying when I left at 5am to go to the hospital for the procedure. I remember the doctor told me that they would need to amputate both arms – they said everything in there, all my muscles, were rock. 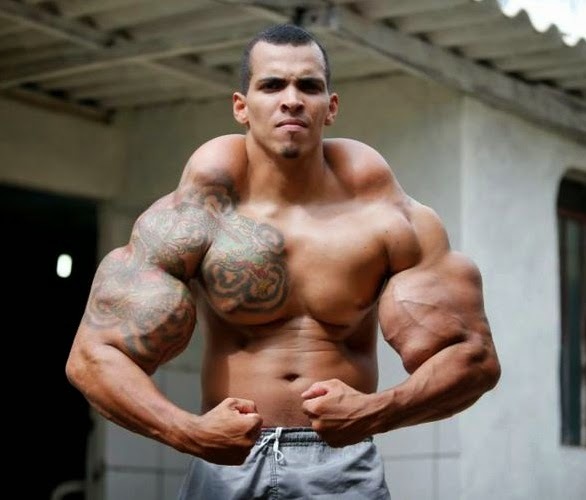 Fortunately, the doctors were able to save his arms by removing the synthol rocks which had formed in his arms. He has now not used the substance for two years and, while he admits he’s still tempted by muscle enhancing drugs. But now he wants to achieve his ambitions of being a professional bodybuilder through exercise and diet alone.